What Is It With The Word “Just”? Based on a Networking Event last night and another this morning, why is that many Women Business Owners think so small? What is it with the word “just”? Yes, they’ve all heard of “Start With The End In Mind” but quite honestly, does it really apply to them? Yet? But how? Here’s the thing… do what Seth Godin suggests and DO it anyway, “Start the Journey Before you see the End”. 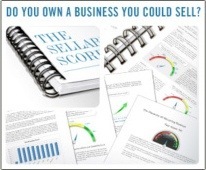 The Sellability Score report enables you to do “just” that. Think of it as a Business Plan in Reverse.